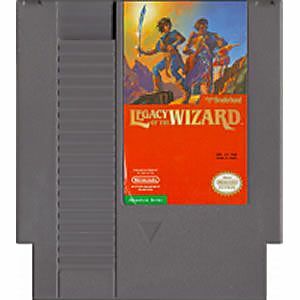 Legacy of the Wizard original NES Nintendo Game cartridge only - Cleaned Tested and Guaranteed to Work! To be fully honest. I absolutely love this game! I never really found it hard in difficulty. Just maybe finding some of the secrets throughout. 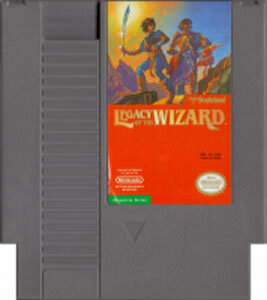 But regardless; this is one of my favorite NES games. Just goes to show you that the best/fun games aren't always the overly expensive ones. Do yourself a favor a grab this for $5! You won't regret it! I heard about this game from an episode of the Japanese show, Game Center CX. Pretty huge in scope! You will probably need to reference gamefaqs.com or similar website to figure out the goal of the game (you have multiple playable characters, each with their own specific boss to kill). This game was famous or perhaps infamous for its difficulty. Even so it's probably one of the most well-loved games on the NES. It tells the story of the Warzen family, referred to in the instruction booklet as the Drasle family for some reason. These four are magicians who set out to explore the vast labyrinth near their home after their monster pet Pochi discovers a scale of a gigantic dragon, Keela, who had long ago been sealed within the labyrinth by a now-deceased wizard. He was, in fact, a member of the Drasle family. The discovery of the dragon's scale prompted Xemn and Meyna Drasle, the mother and father, to wonder if the dragon might be about to awaken. They decided to set out in search of the mighty Dragonslayer sword,the only weapon that had any hope of vanquishing Keela for good. Considering the sheer size of the labyyrinth, however, Xemn and Meyna's two children, daughter Lyll and son Roas, urged their parents to let them aid in the search. Pochi, always loyal, went along as well. So your goal is to take each member of the Drasle family into a certain section of the dungeon where an enchanted crown is hidden. Only Lyll, Meyna, Xemn and Pochi can access the crowns since only they can use the items needed to reach them. Once the four crowns have been found they can use them to access the Dragonslayer, which Roas alone can use. This game was, as I said, known for its difficulty, due mostly to the fact that while there is some backstory the game gives you no clues, and I mean none whatsoever, as to where you should go within the dungeon. Things were also complicated by the fact that the game uses a password rather than a save system. The only way to get a password was to talk to your grandmother back at the family residence. Then you had to talk to your grandfather (though not the one responsible for sealing Keela in the dungeon), to actually use the password. All the password does is store your items and gold and any crowns you'd collected. The game is also known for its amazing soundtrack. There's a main overworld theme which is nice and upbeat and a pleasant, sedate theme for the family home and for the inn. The main labyrinth has its own theme and then each character has his or her own theme which plays in their section of the dungeon. It's some of the best music on the NES as far as I'm concerned. Sound effect wise it's really nothing special, but there are a lot of effects and they get the job done well. My only complaint is the odd effect for when the dragon breathes fire, which sounds more like something I might expect to hear in a game like Excitebike. All in all though the audio is good and helps you get into the game experience. 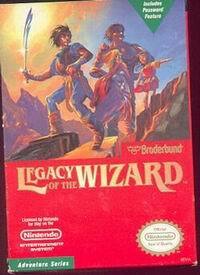 Overall this is probably one of the best games on the NES as far as I'm concerned. If you haven't played it yet you should definitely give it a go. You might just be in for a treat.